Nov01 Comments Off on America’s First Daughter is a Goodreads Choice Award Nominee! America’s First Daughter is a Goodreads Choice Award Nominee! 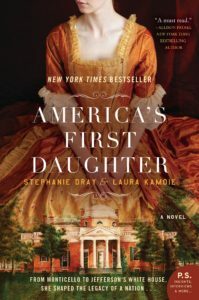 Stephanie and I are thrilled to share that AMERICA’S FIRST DAUGHTER has been nominated for Best Historical Fiction of 2016 in the Goodreads Choice Awards! The editors at Goodreads choose the books to nominate, but it’s readers like you who pick the winners through several rounds of voting. So PLEASE take a moment to hop over there and vote for AFD, and check out the other categories too! Thank you so much for considering! We’re just beside ourselves! ← Join in our Fall Book Tour!